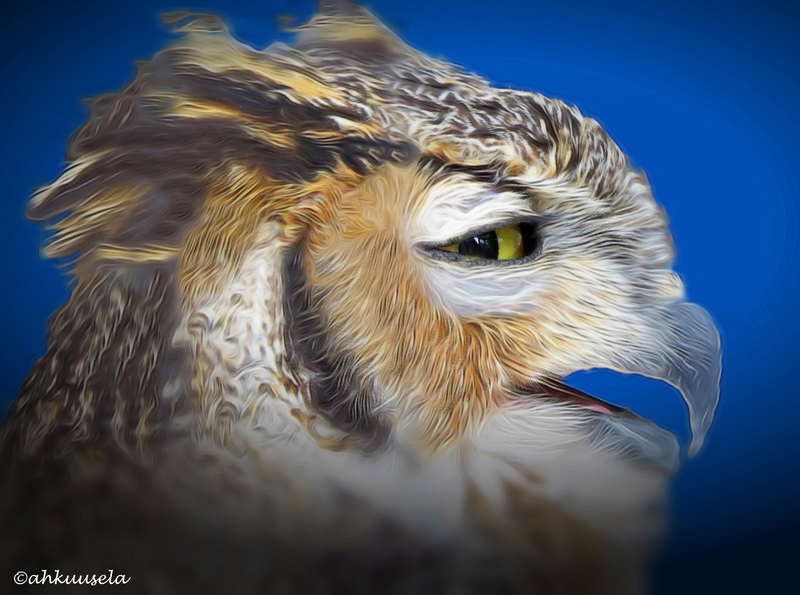 I hear a stern warning from the nest. I hear another warning from somewhere close by. 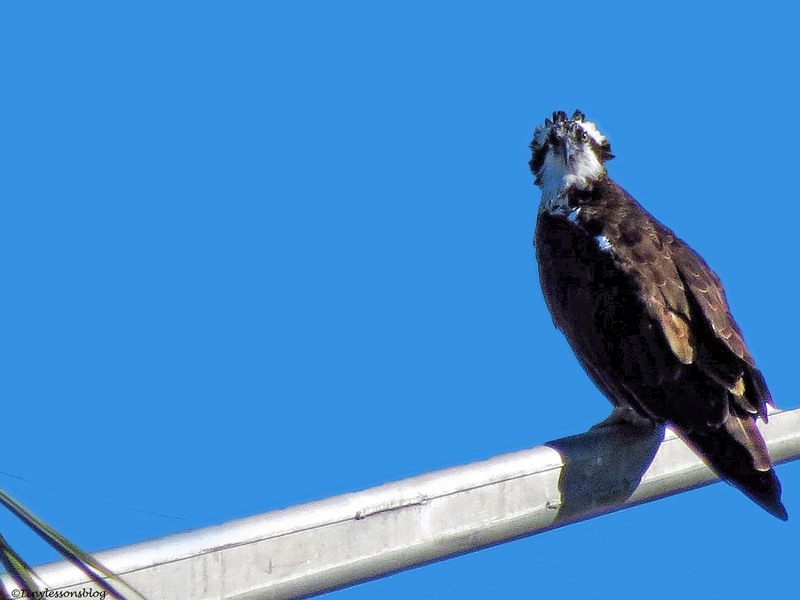 Then I hear a perfect duet of loud Osprey warnings. 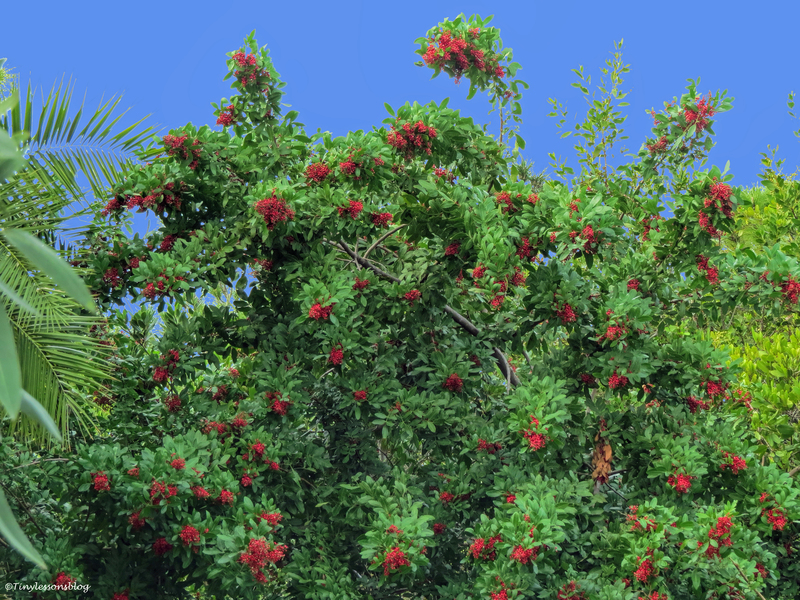 And I look up and around. Up in the air a male Osprey is circling low over the nest, looking down and making sweeping fly-bys towards the nest where one of the parents is sitting on the egg(s). 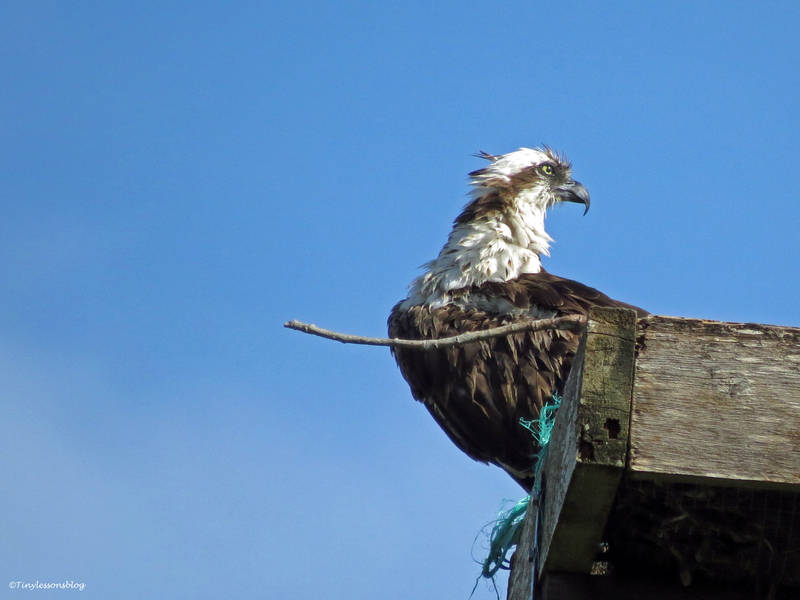 The parent in the nest turns out to be Papa Stanley. Because Mama Sandy happens to be on her break. 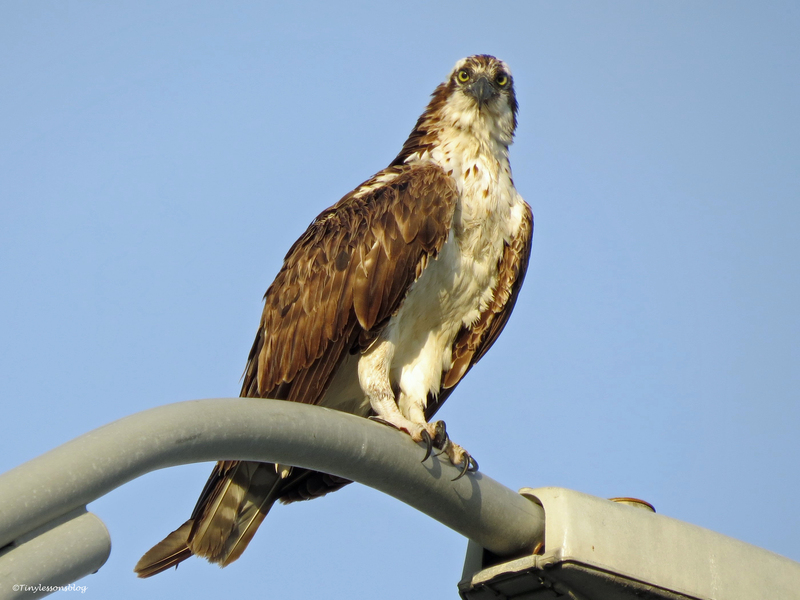 She is perching on a lamp-post at a parking lot just outside the park boundary. 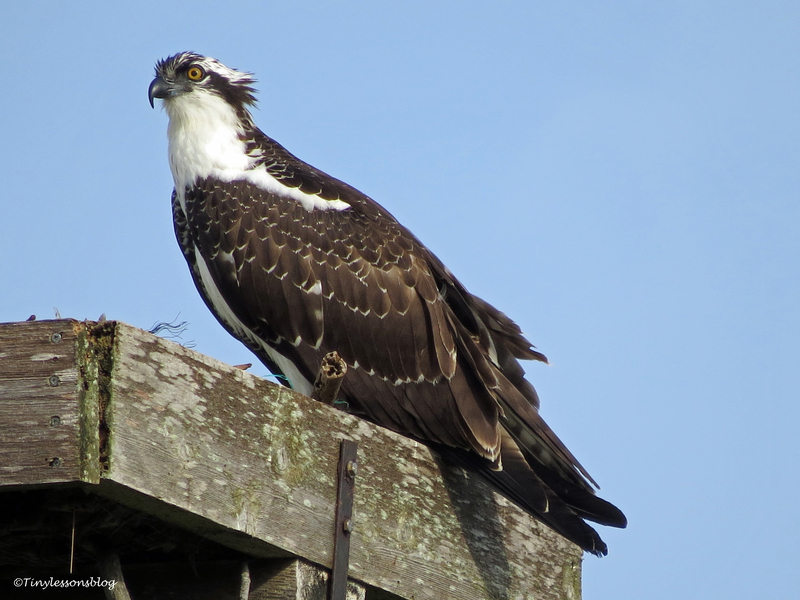 She has a straight line of sight to the nest and helps Stanley to warn the unwanted visitor. 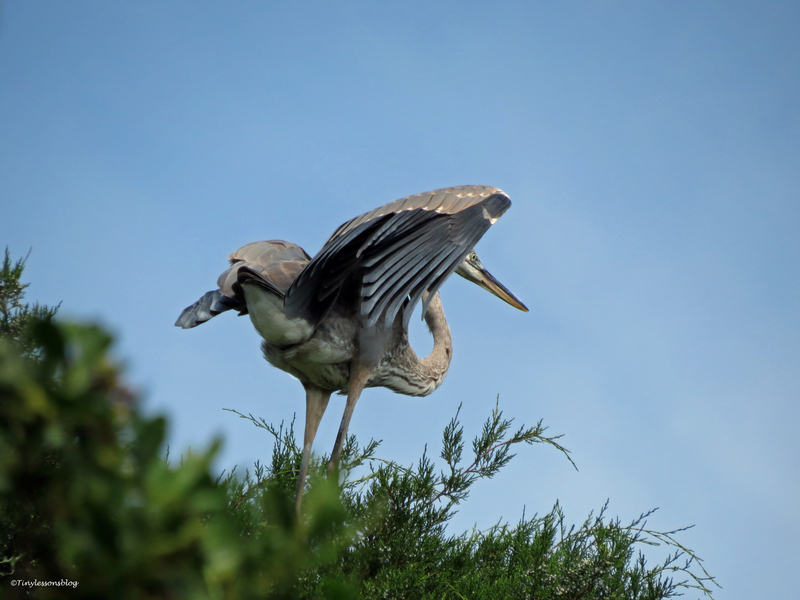 The “Mayor”, a Great Blue Heron, happens to be just below the nest when all this unfolds. 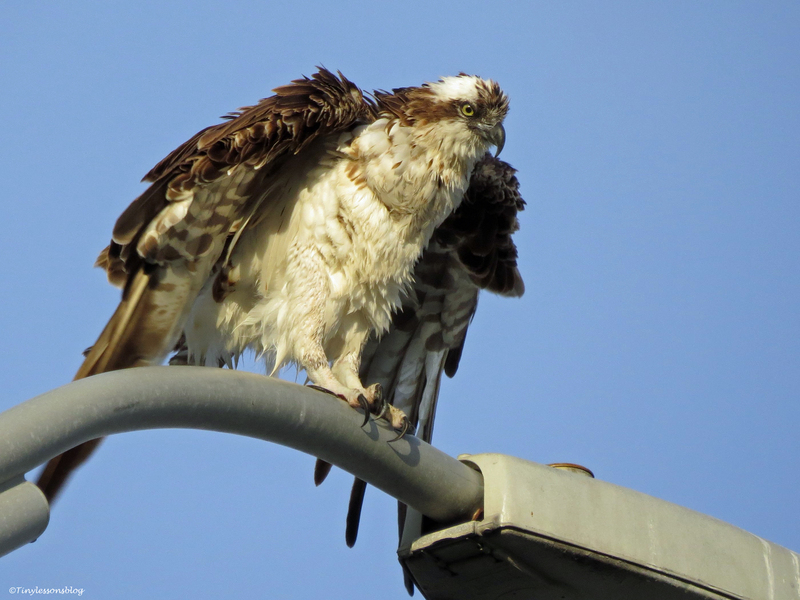 Being an old friend of the Osprey couple, he finds such a disturbance highly unfortunate too. Hair-raising in fact. 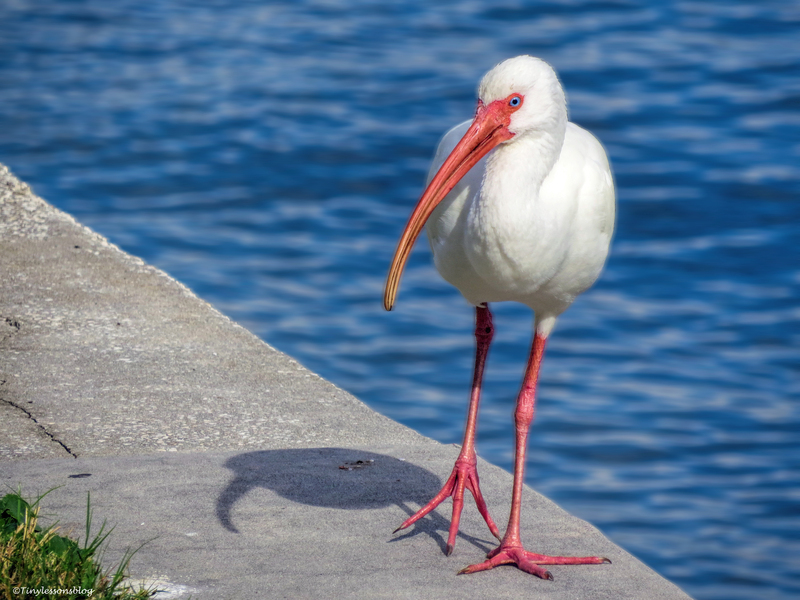 As the drama progresses, and the guy in the sky continues his stalking, Sandy decides it’s best to return to the nest, take over from Stanley and let him handle the defense department. The shift change is fast, two-three seconds tops. Stanley leaves immediately to take care of the threat. 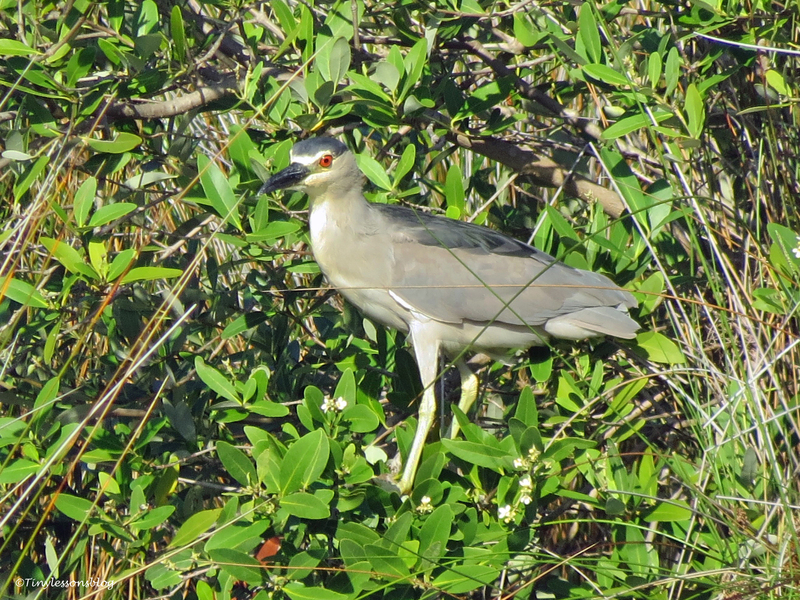 He chases the intruder away from the salt marsh. 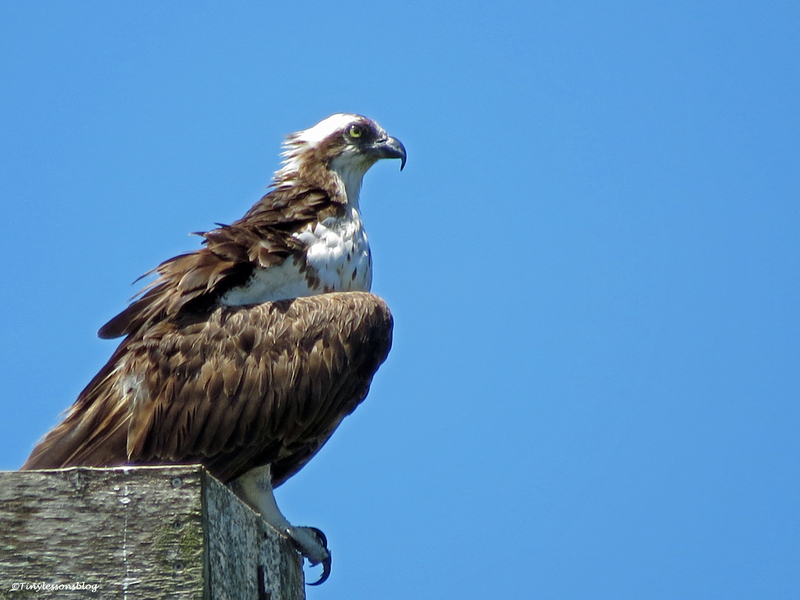 And continues patrolling the sky above the nest for at least 20 minutes afterwards. Impressive. 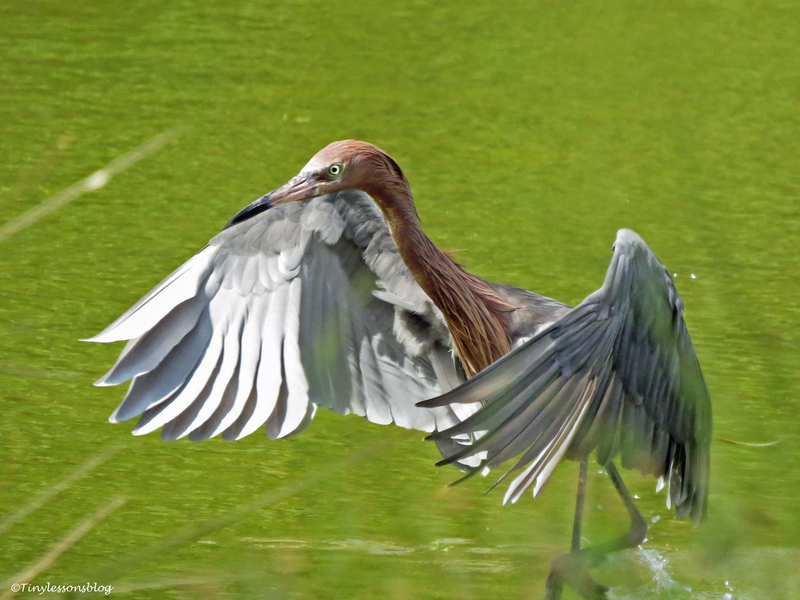 Peace returns and I can move on to enjoy the entertainment provided by the Reddish Egret at the other end of the marsh. The “Clown” has returned while I was away. 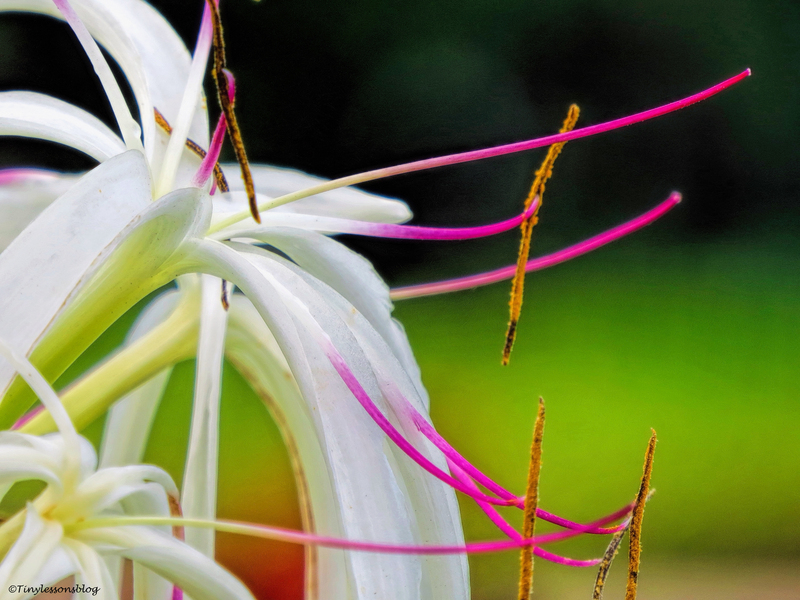 He is as exuberant as ever and puts up quite a show. 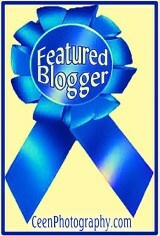 So please check it out. 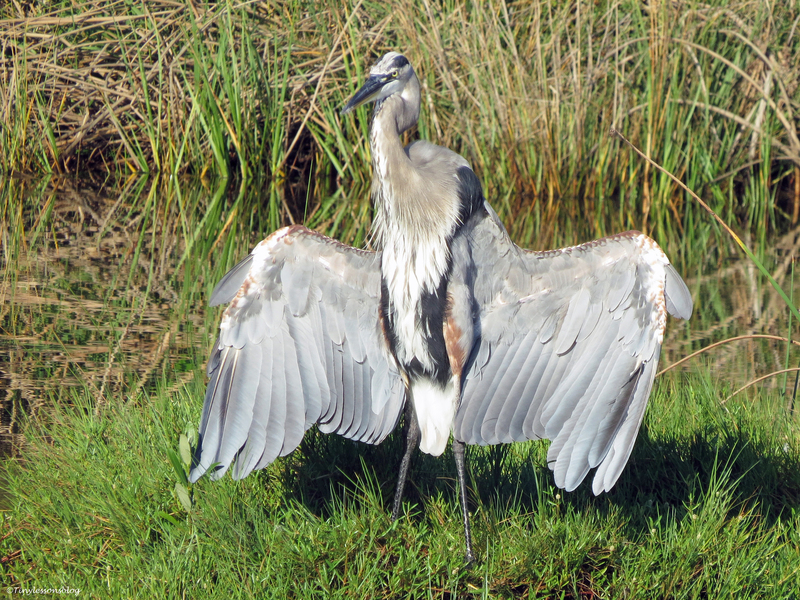 He runs around, jumps, flexes his wings, covers his head from the sun so he can see the bottom, and has a generally jolly time in search of that perfect lunch item. I’m smiling. But I’m not alone watching the spectacle. 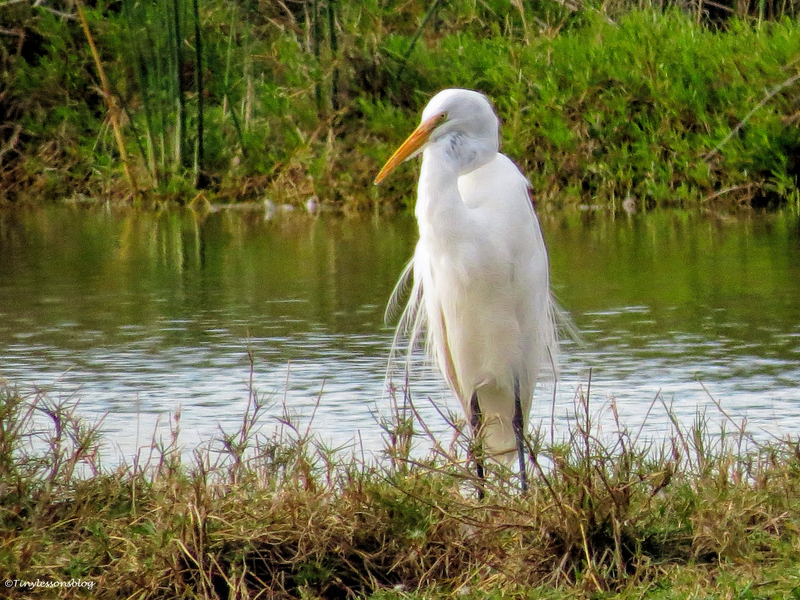 A Great Egret is following the hunting party at a safe distance with great interest. The newly returned Mottled Duck couple have their eyes nailed to the Clown’s performance as well. 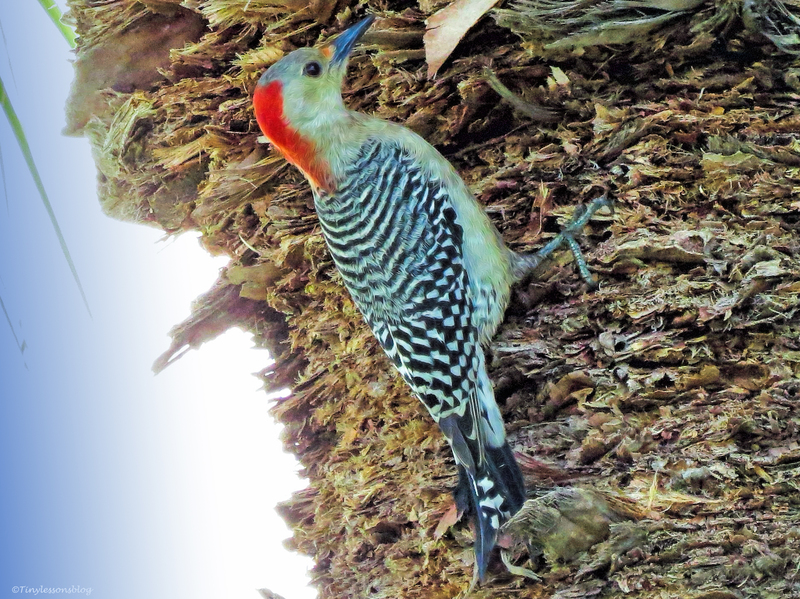 In a nearby palm tree, the female Red-bellied Woodpecker almost twists her neck trying to see what’s going on. 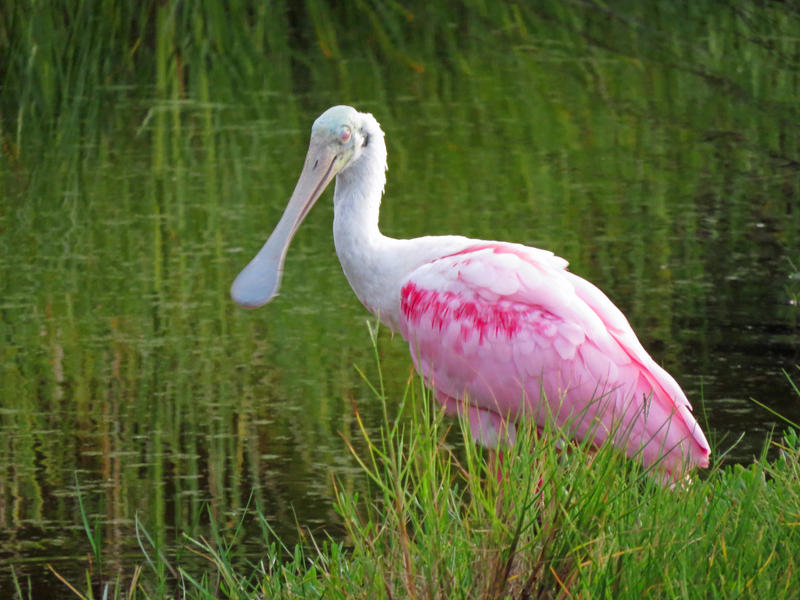 But at the other end of the marsh nobody cares. 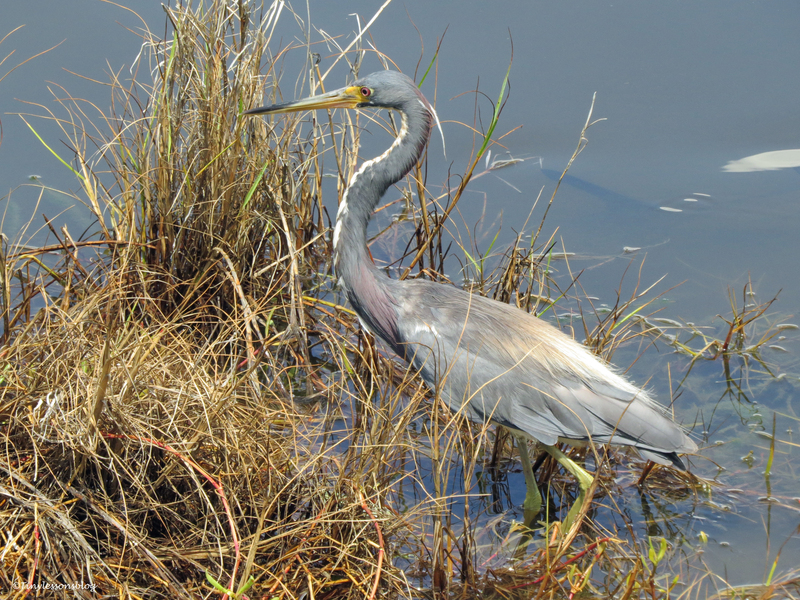 The gracious Tri-colored Heron has the fishing waters all for herself. Well, almost. 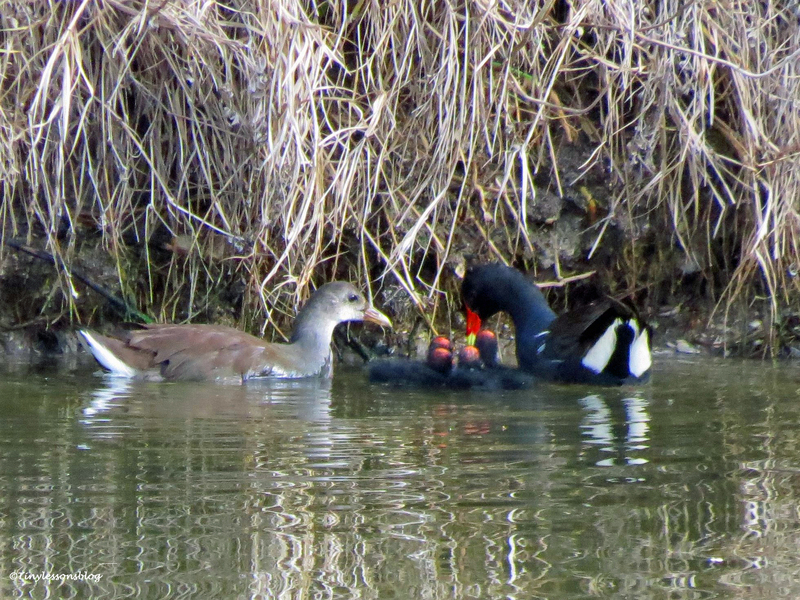 The tiny Grebe and a few Moorhens are there too enjoying the sunny afternoon. But my buddy, the Muscovy Duck, has left the salt marsh – possibly to search for a mate, just like last year. 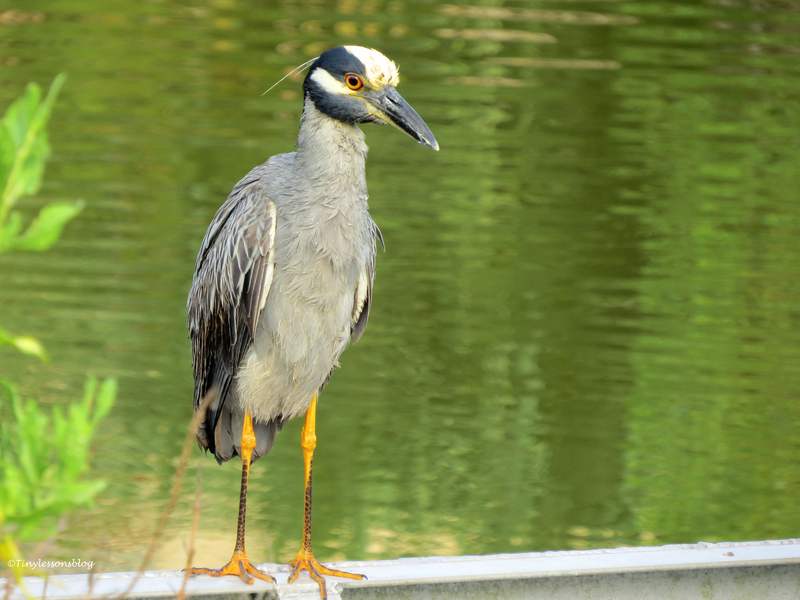 Another returnee, the Green Heron, and his cousin, the Yellow-crowned Night Heron, are both taking in the now peaceful scenery close to the Osprey nest. 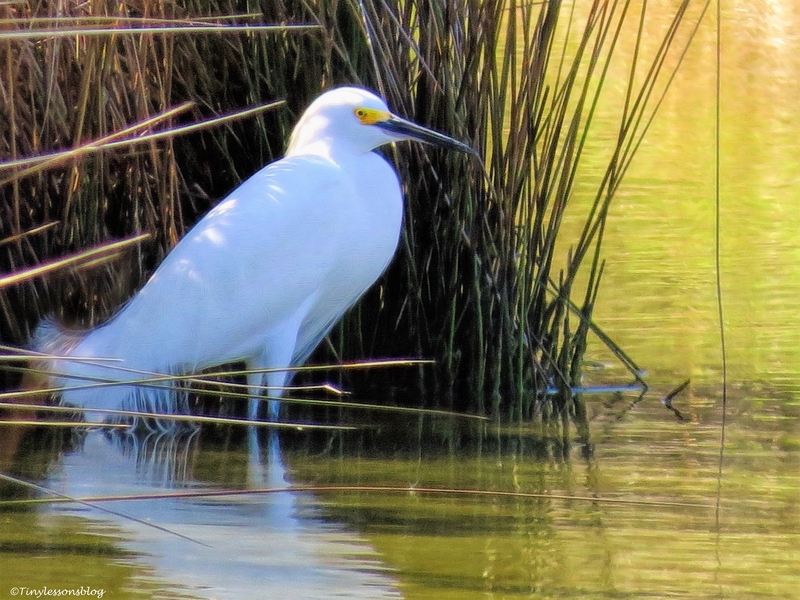 Just when I am leaving, I spot the tiny Snowy Egret I first saw in January. 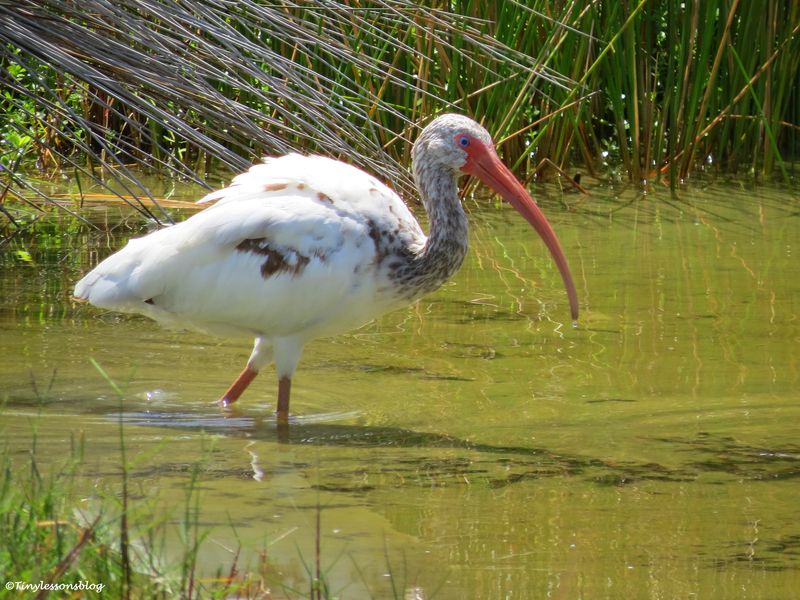 She may be one of the many wading birds that were born here last year. 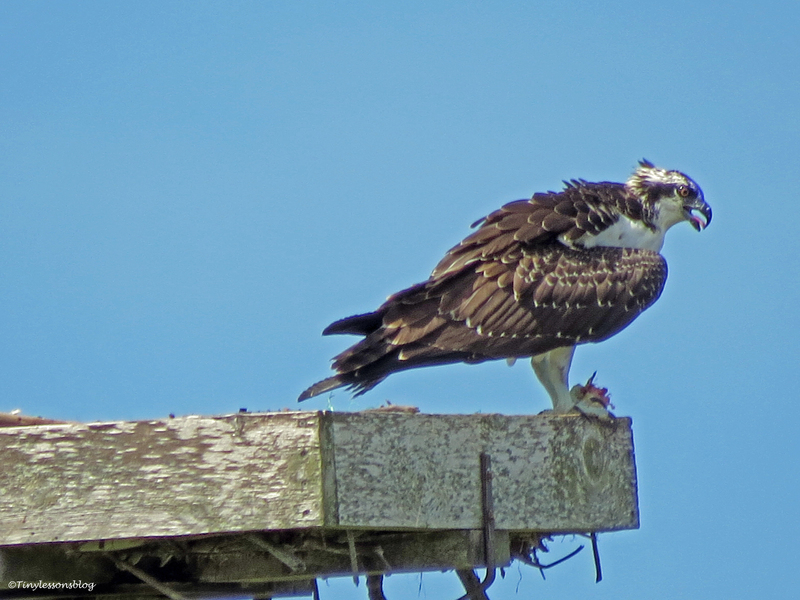 Walking back home, I find Papa Stanley close by on his new “nesting season perch” from where he can see and hear everything that happens at the nest. I am happy I could finally visit my friends at the salt marsh (twice) after almost a month of absence and before my next work trip at the end of next week. I wish you all a wonderful weekend. She saw me. Looked twice. And sang a short welcome-home-song for me. Loud. From the heart. Then she looked at me as in asking whether I liked it. Miss Rosa made me smile. 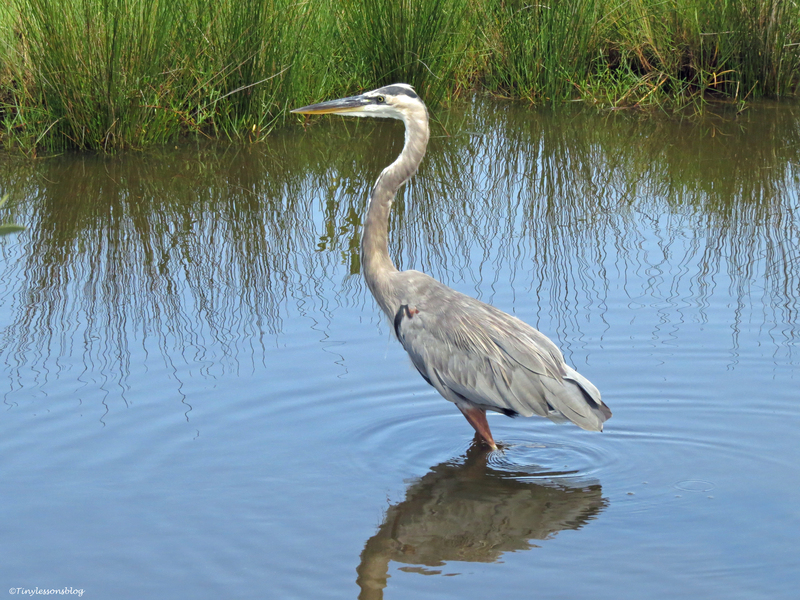 And I felt welcomed back to the salt marsh. 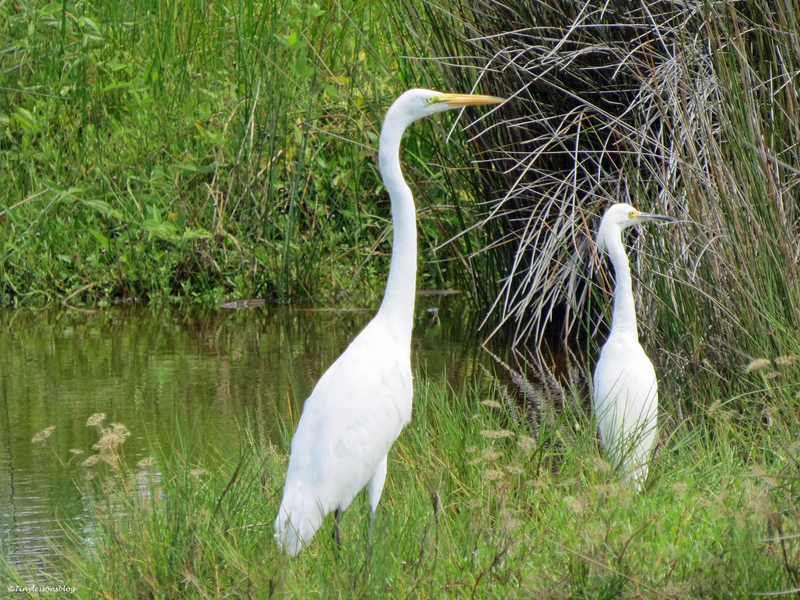 I had finally managed to make the time for a walk to check on my feathered friends. And there was no doubt I was back in Florida. 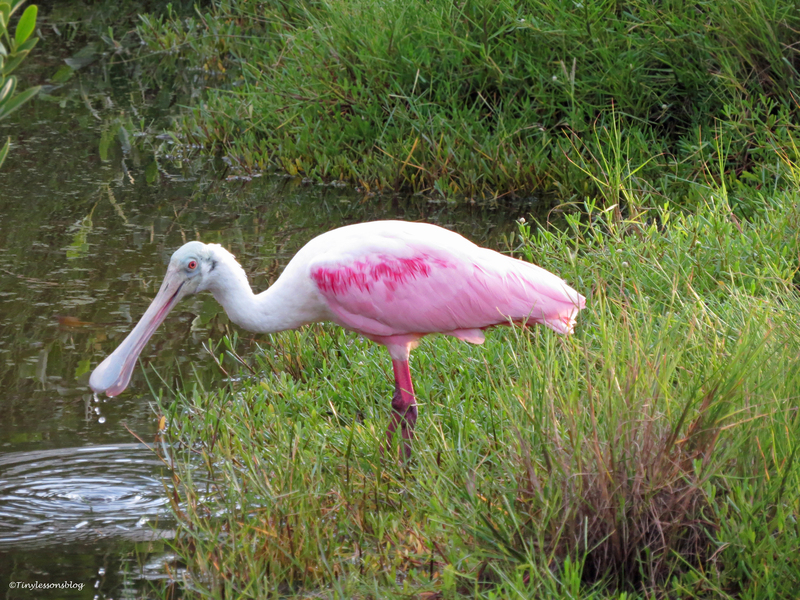 The salt marsh was blooming in all possible colors, delicate and bold. I found the Mayor at his favorite spot on a small islet. He was in deep thought. Maybe pondering about the upcoming holiday party. 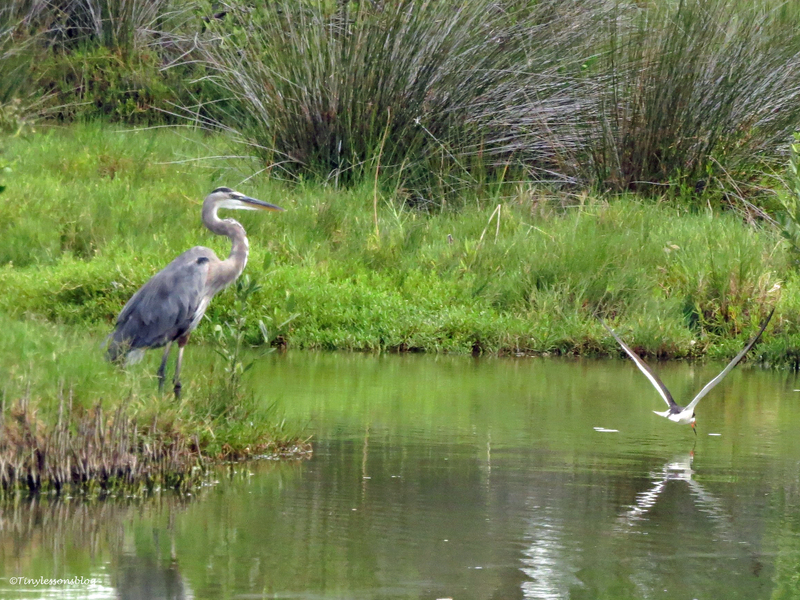 It’s always a lively event at the salt marsh. 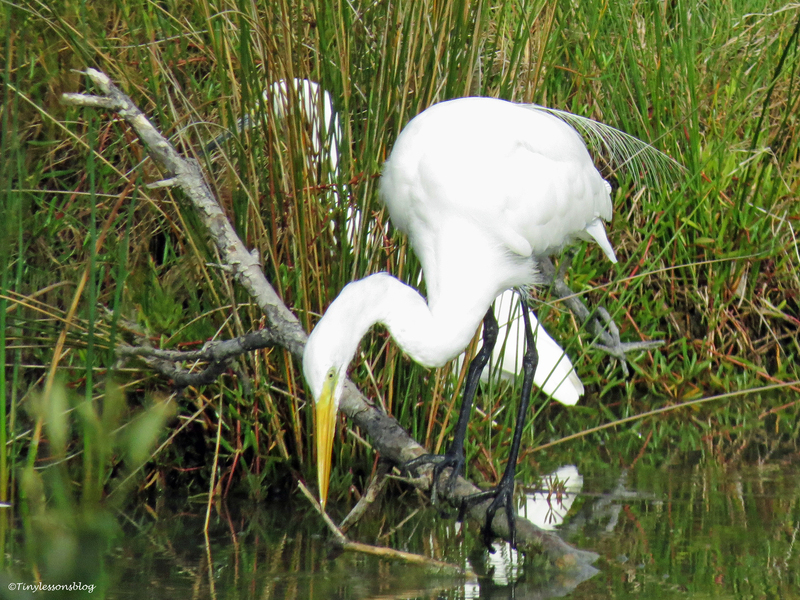 I noticed the herons and egrets had already started changing into their festive breeding plumage. 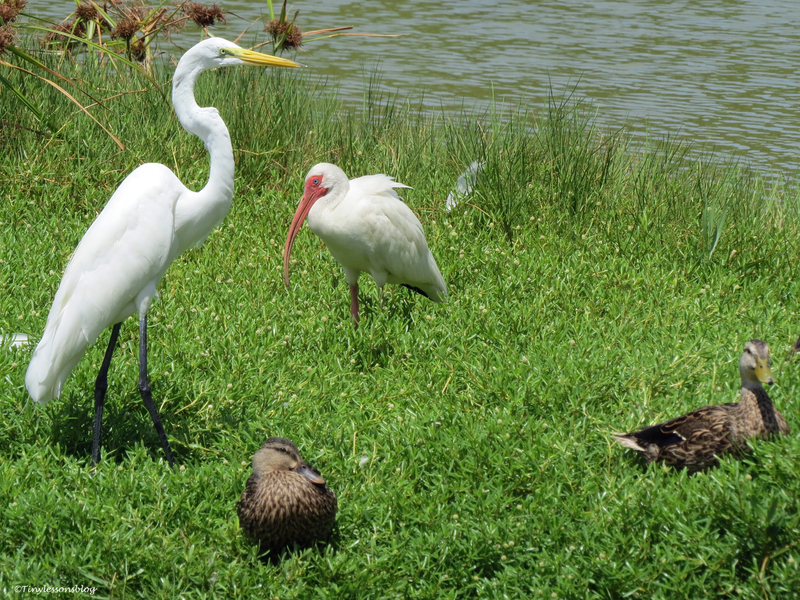 Demonstrated here by the Snowy Egret, and the Great Egret little further away. Mama Sandy was at the nest when I arrived. 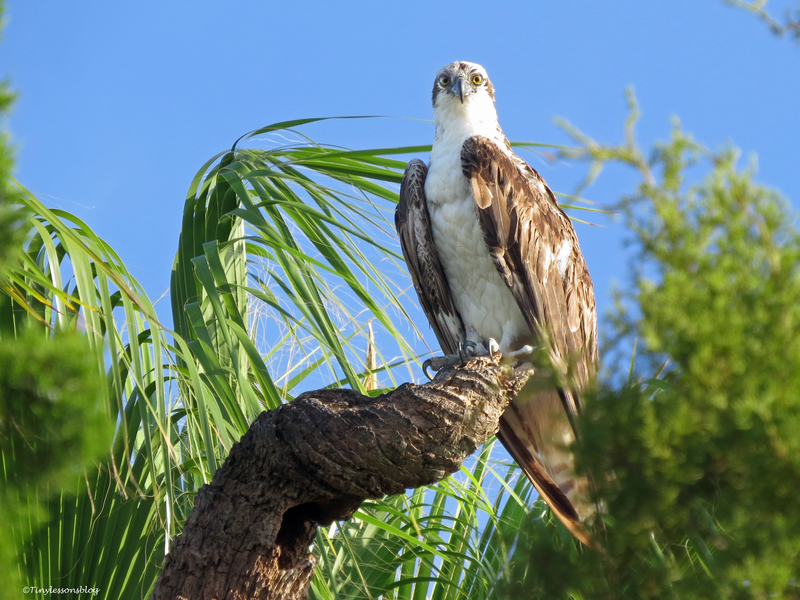 But she was scanning the skies where another Osprey was circling high up at a distance. 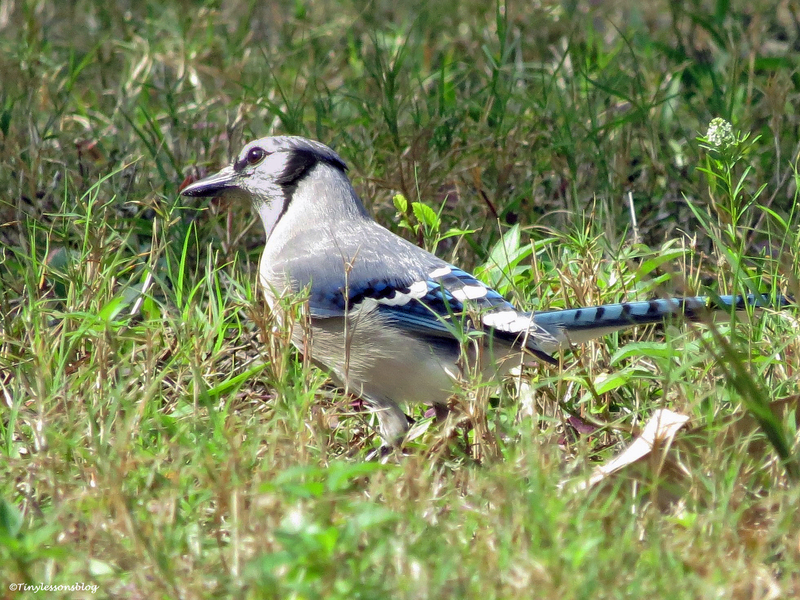 She nodded a brief hello and flew away after a couple of minutes. 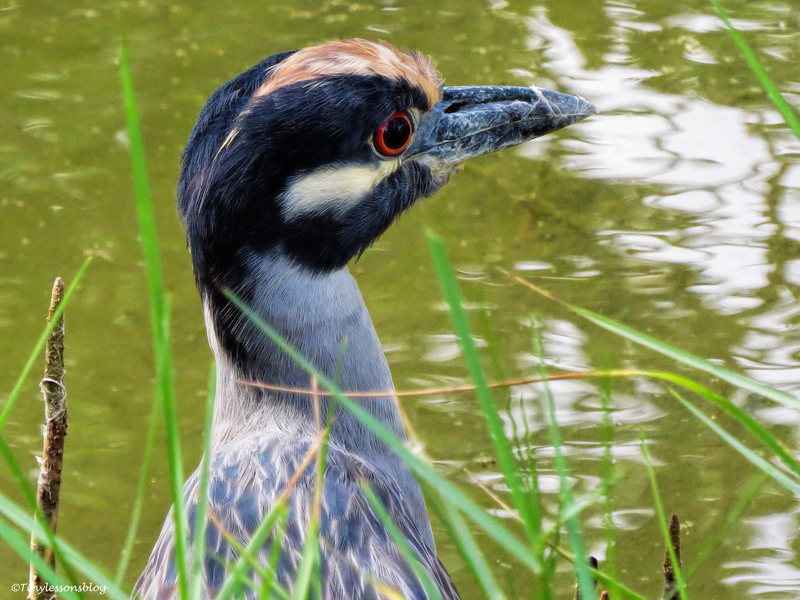 I was trying to get a picture of a Yellow-crowned Night Heron, who was hiding in the high grass, and a juvenile resting in the bushes right below the nest, when I heard Osprey speak. 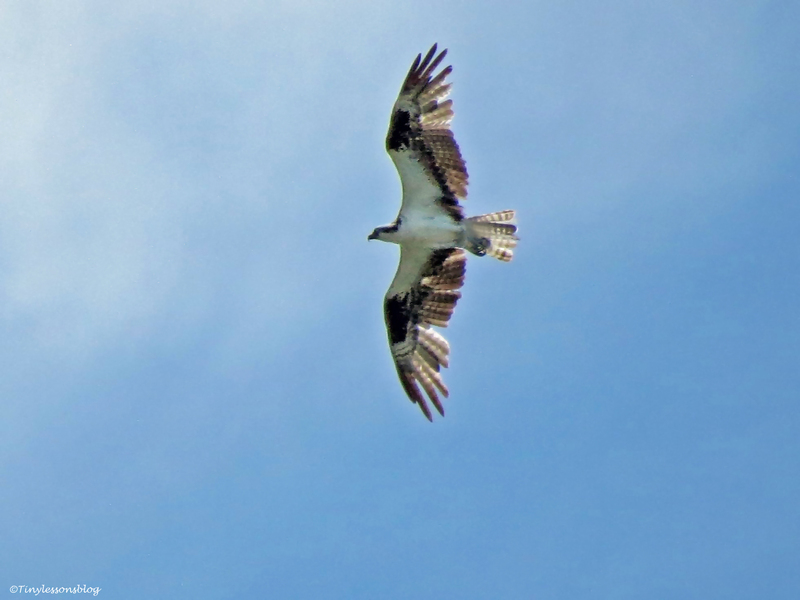 I looked up, and saw Sandy fly right over the nest with Stanley following close behind. Courting behavior. 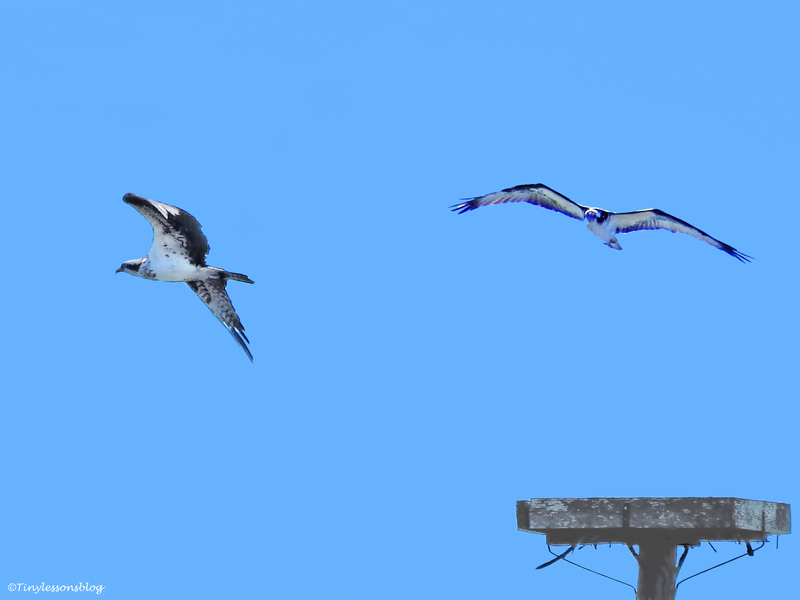 And by flying right past the nest, I thought, Sandy gave Stanley a hint about the proposal gift and the customary dance expected to take place shortly. 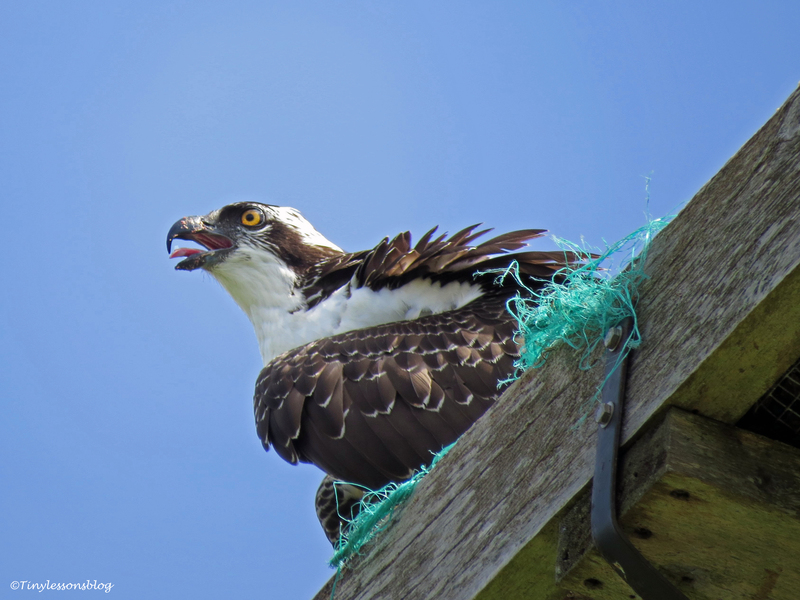 A strategic reminder that the time for Stanley to come back to the nest was getting close. Three weeks tops. 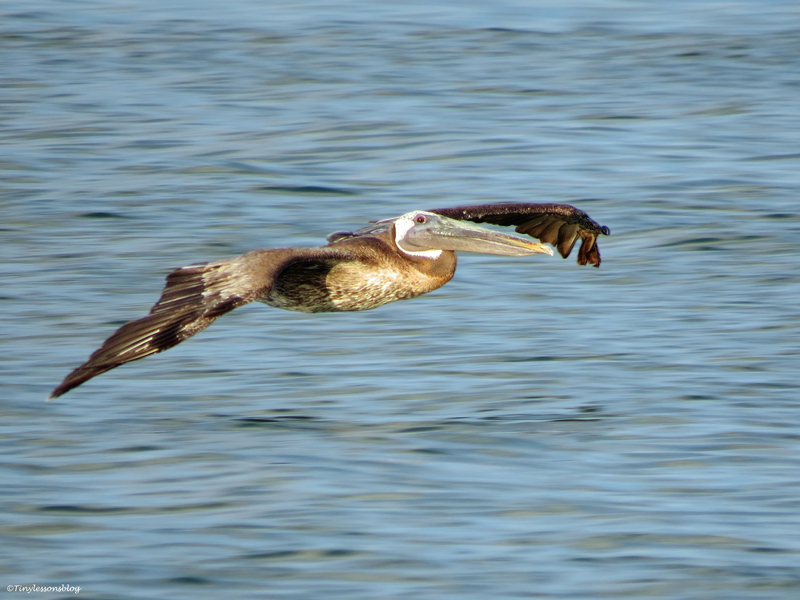 They flew together for quite a while and I decided to check who I could find on the bay side. 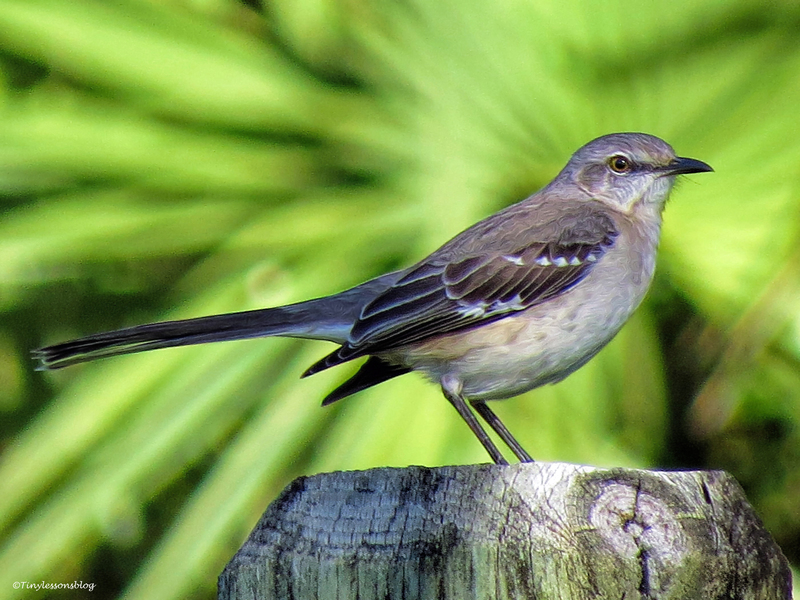 On my way there, I saw this beautiful Northern Mockingird. And was offered a demonstration in magic when a leaf on the ground suddenly started walking. 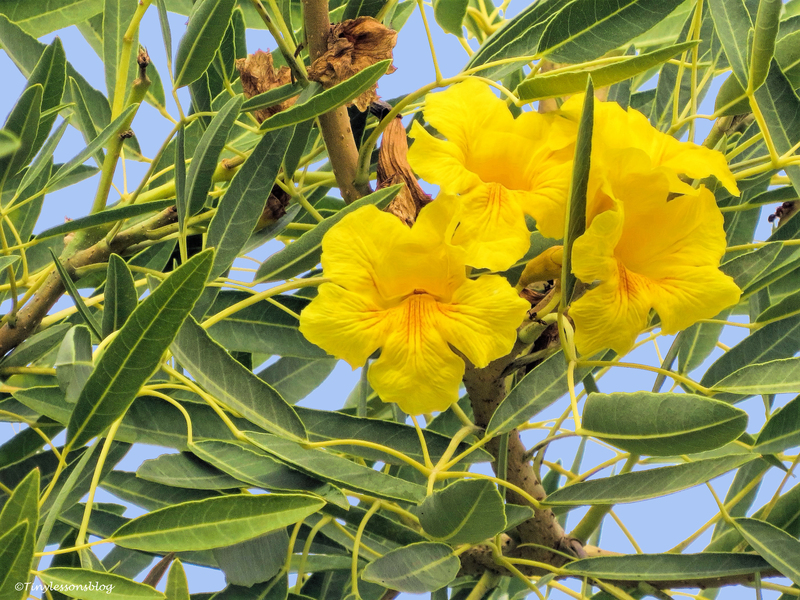 One of nature’s little miracles. 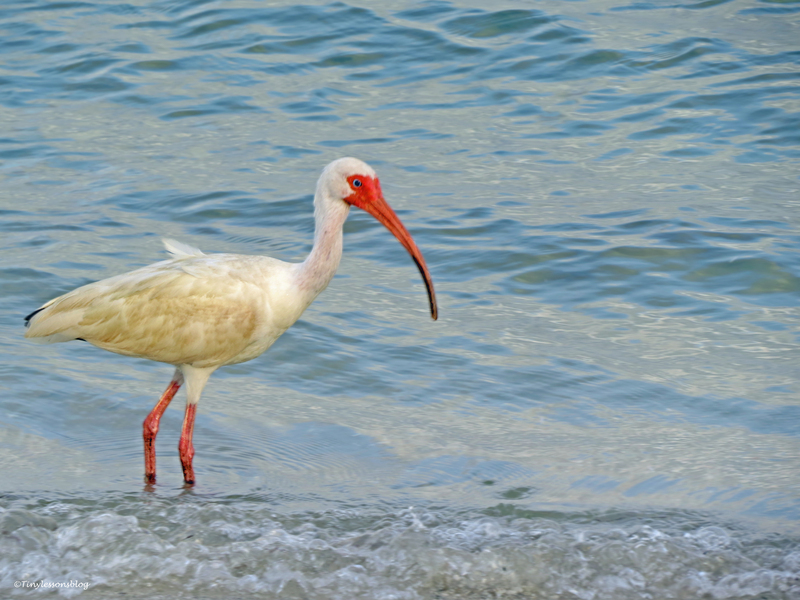 On the bay side I was greeted by a flock of White Ibis feeding on a patch of grass. And then strolling back and forth on the sea wall. Close by a female Red-bellied Woodpecker was working on a thick palm trunk. Most of the time only half of her body visible. I was just leaving to go home when I spotted Stanley at the Sailing Center. 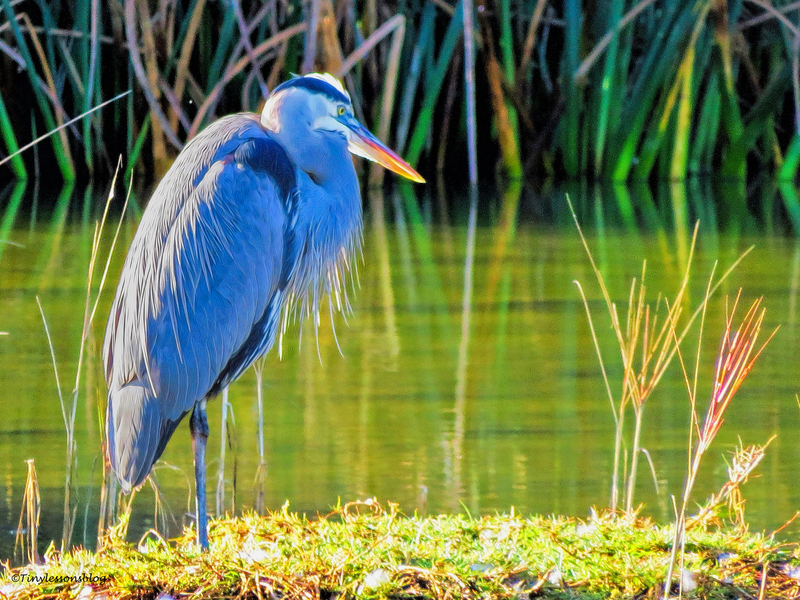 He was not scanning for fish, instead he was staring intently at something in the direction of my home. 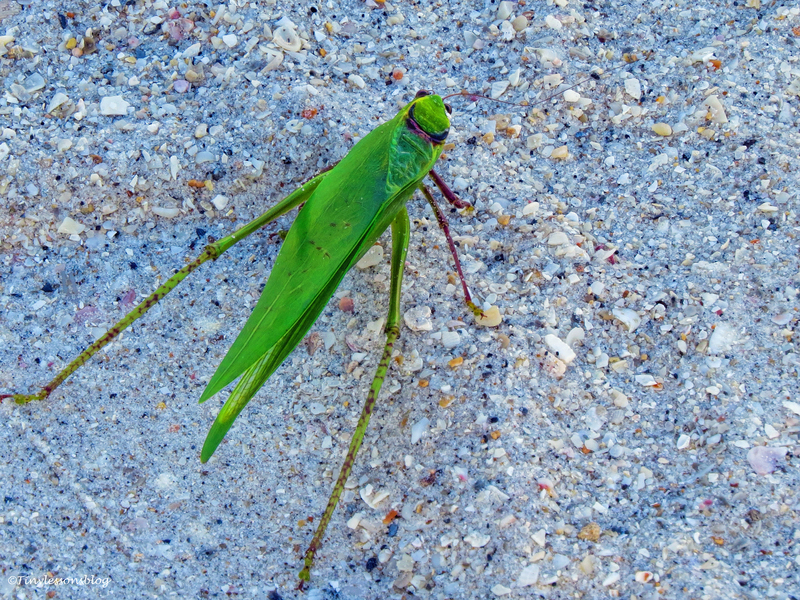 Walking back home, I spotted the object of his interest. 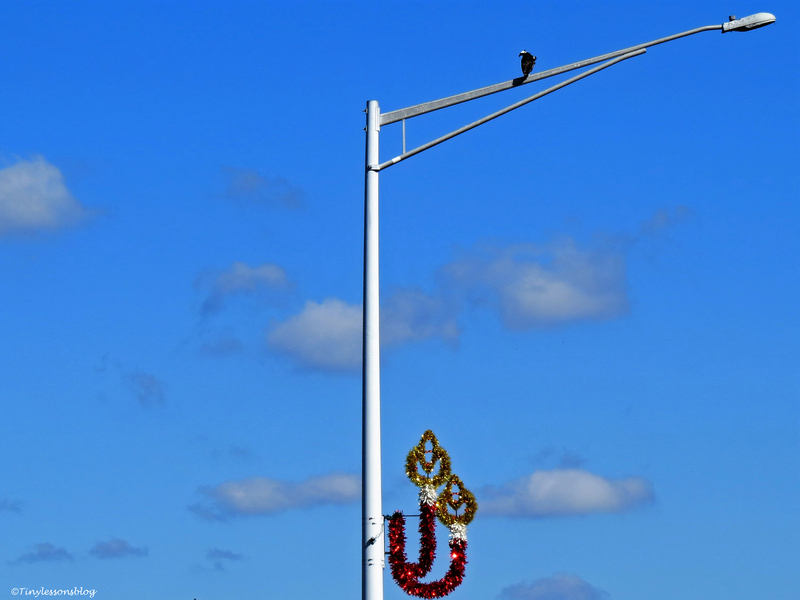 Sandy was perching on the holiday decorated lamp-post closest to our driveway. Love is clearly blooming between the two of them. He couldn’t take his eyes off her. 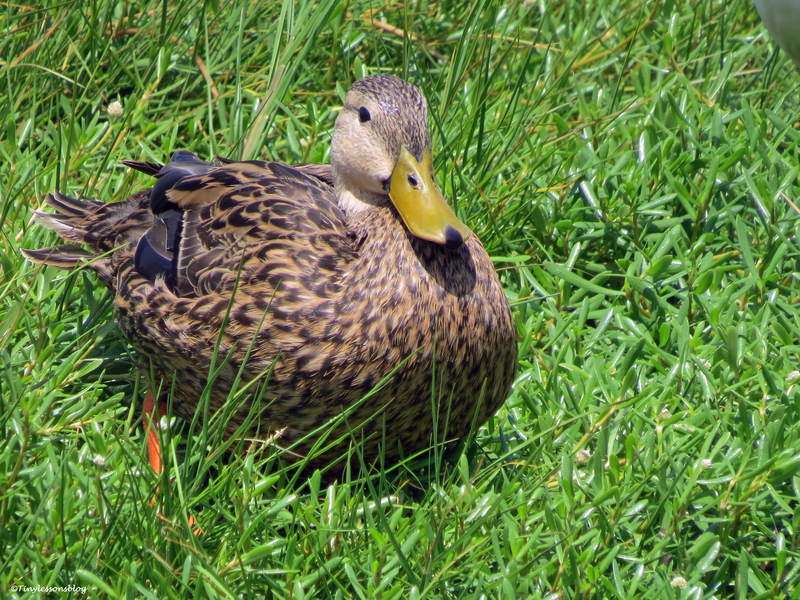 When I reached our front yard, I noticed Sandy was watching me. She clearly knows where I live, and I hope she had missed seeing me when I was away. At least a little bit. It will be a privilege to witness their upcoming nest renovation project and hopefully get pictures of the chick(s) when the time comes. Goodbye Girl! And Other Breaking News from the Salt Marsh. 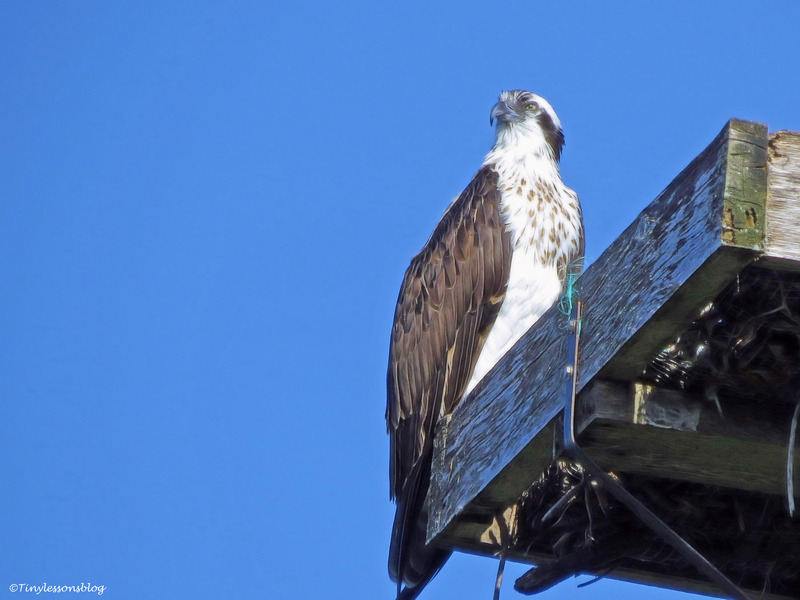 Little Sindile, the youngest of the three Osprey chicks, was alone in the nest. 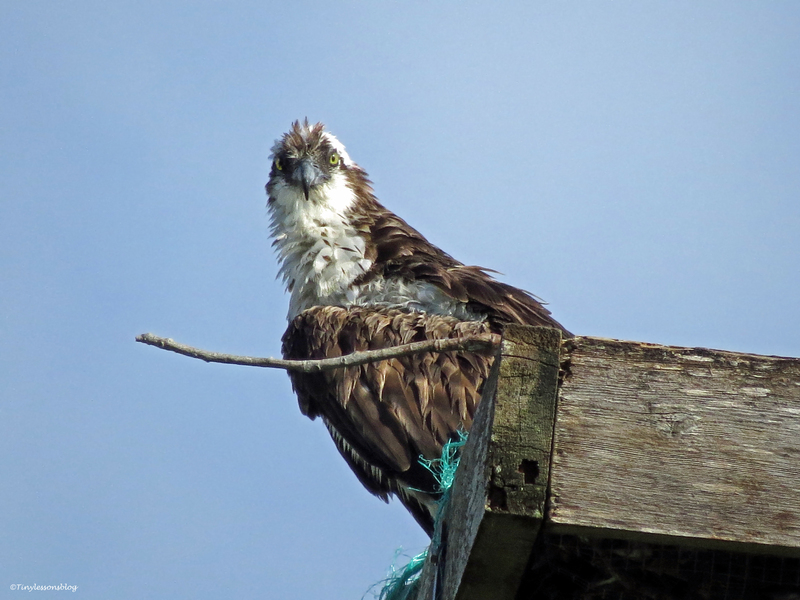 Her siblings had left for their independent adventures several days ago, but Papa Osprey was still around to look after her. 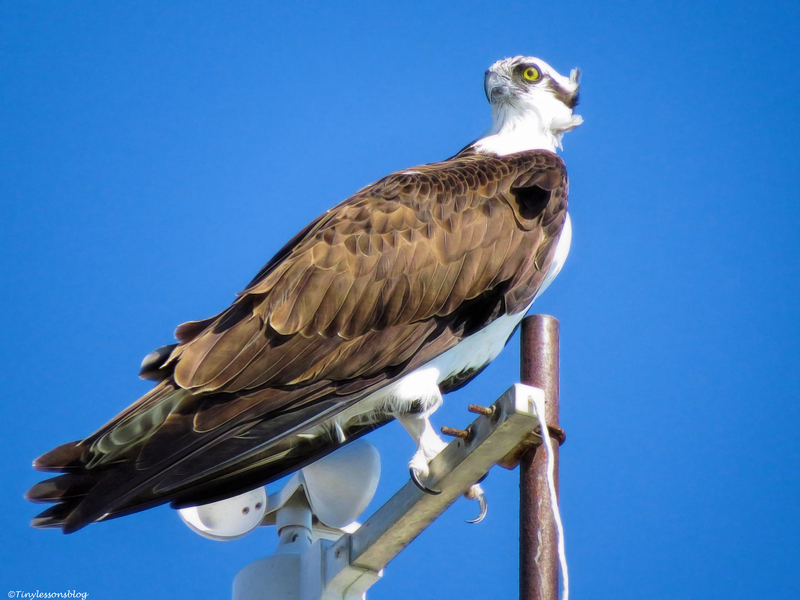 He perched on the bayside at the Community Sailing Center, with a direct line of sight to the nest. 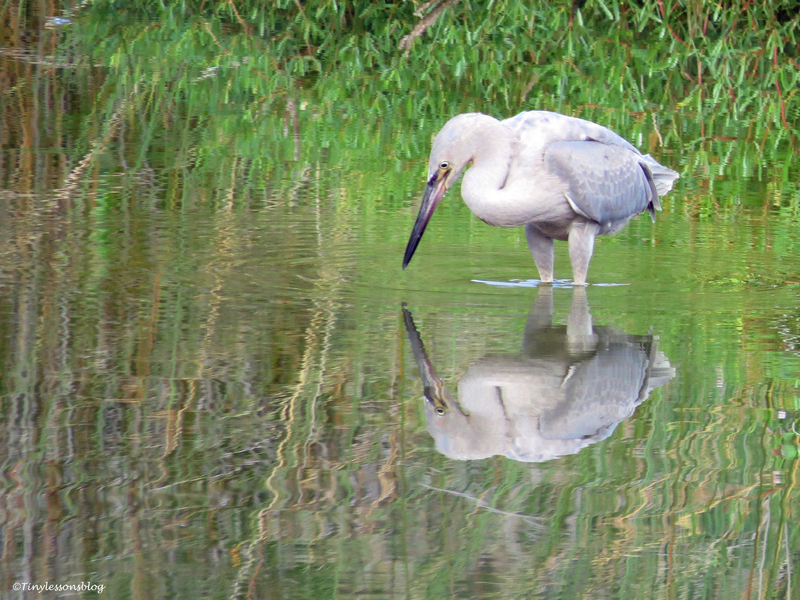 He would bring fish to Sindile a couple of times a day, usually in the morning and in the evening. Sometimes he would eat lunch, but not bring anything to her. That’s tough love. It’s called motivation. He wanted her to go fishing. 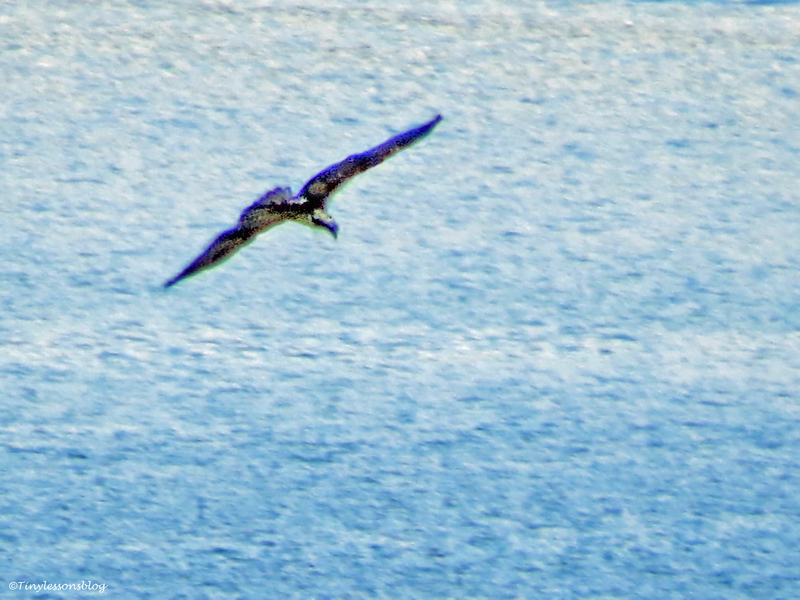 And after frenetically asking for lunch, she usually flew a few rounds over the bay scanning for fish. I didn’t see her catch any, but she might have. On Monday, I discovered something funny. Sindile was in the nest and she asked for fish. But in a way that sounded a bit half-hearted, there was no urgency in her call (unlike in the video clip below I shot on Sunday). 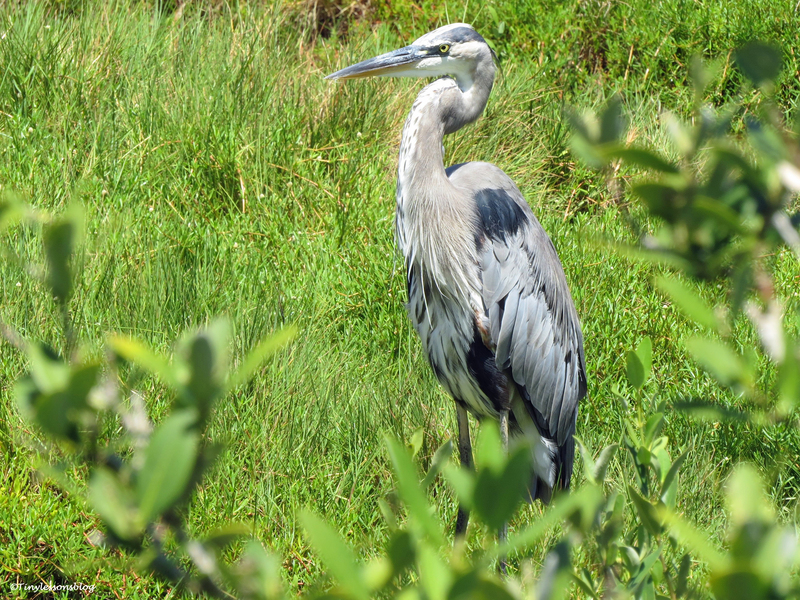 I thought of it when I walked away from the nest to greet other residents of the salt marsh. 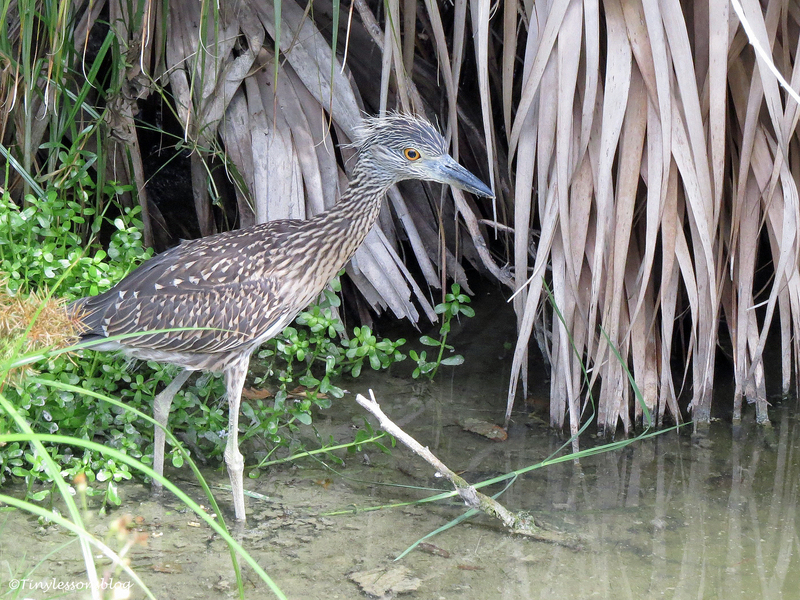 I marveled about Mama Yellow-crowned Night Heron, who tried to land on a thin branch close to her juvenile offspring. The branch broke off, and she fell into the water. Like most moms, she must have been sleep deprived. 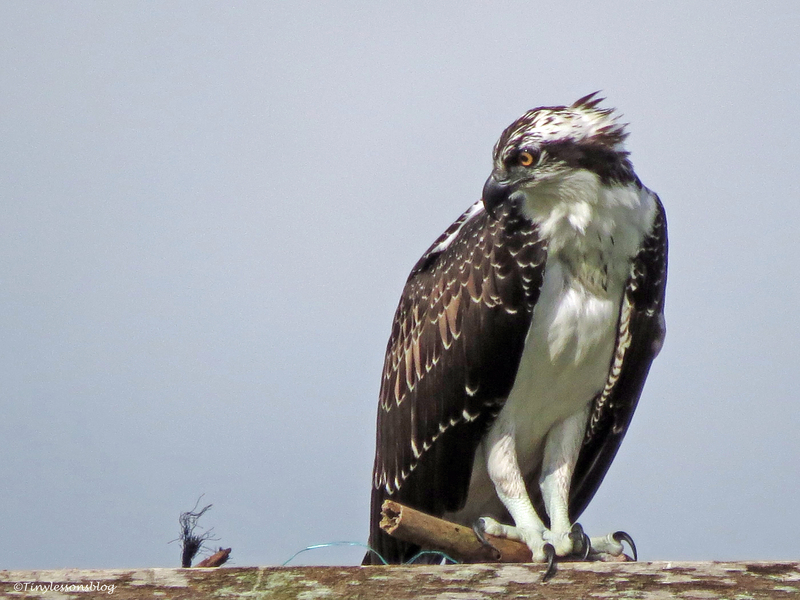 Then I looked back towards the nest again and saw Sindile with a big, half-eaten fish. She was nibbling on it. She had it all along. Apparently it was too big to finish at breakfast, but I was too close previously to notice it from the ground. She may have caught it herself that morning, but thought it wouldn’t hurt to ask for another one 🙂 I had to smile. I saw her for the last time on my early morning walk yesterday. She was looking down into the water where a big fish was making waves. 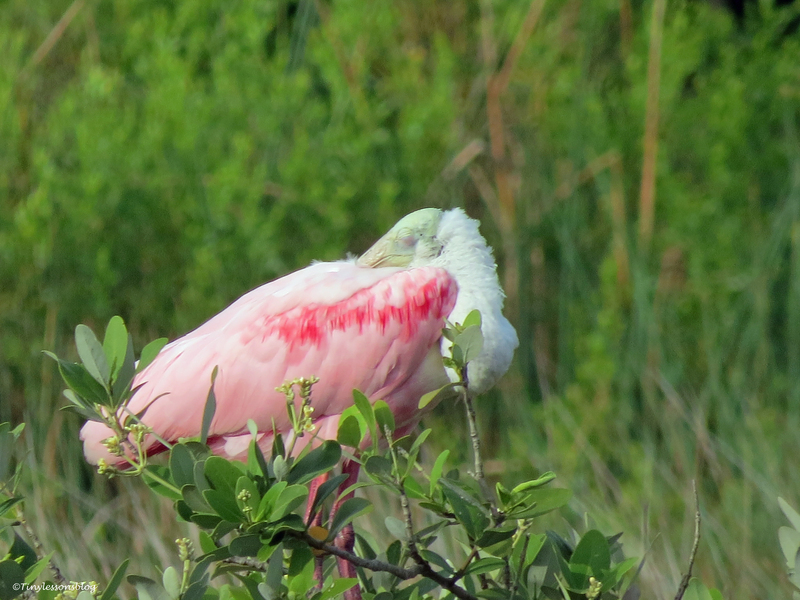 I walked along the northern side of the marsh and saw a Roseate Spoonbill perched on a small tree, still fast asleep. 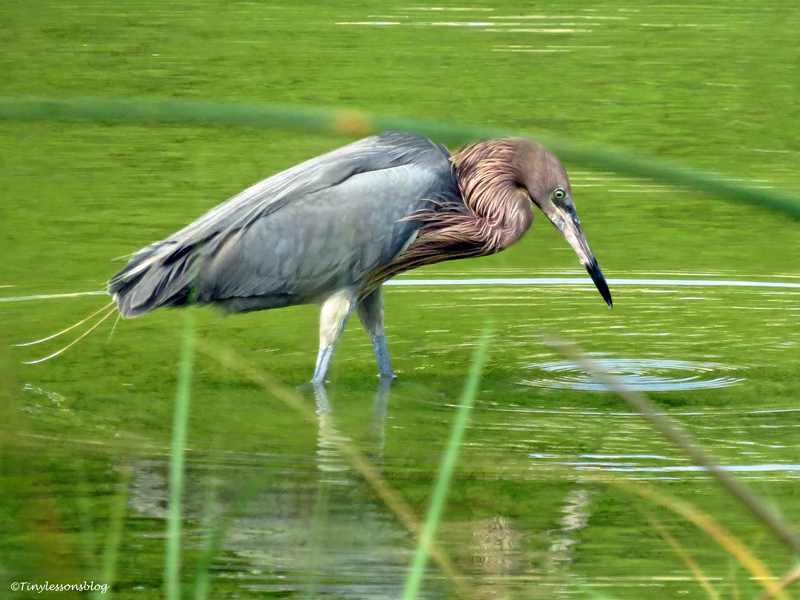 And spotted an old friend, the Reddish Egret, also known as the “showman”. 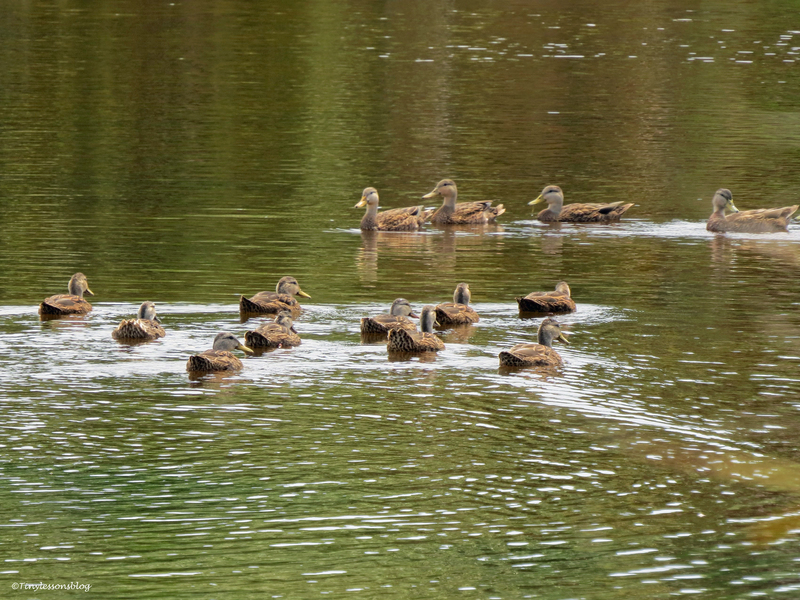 He might have brought his juvenile offspring for a fishing trip at the marsh. 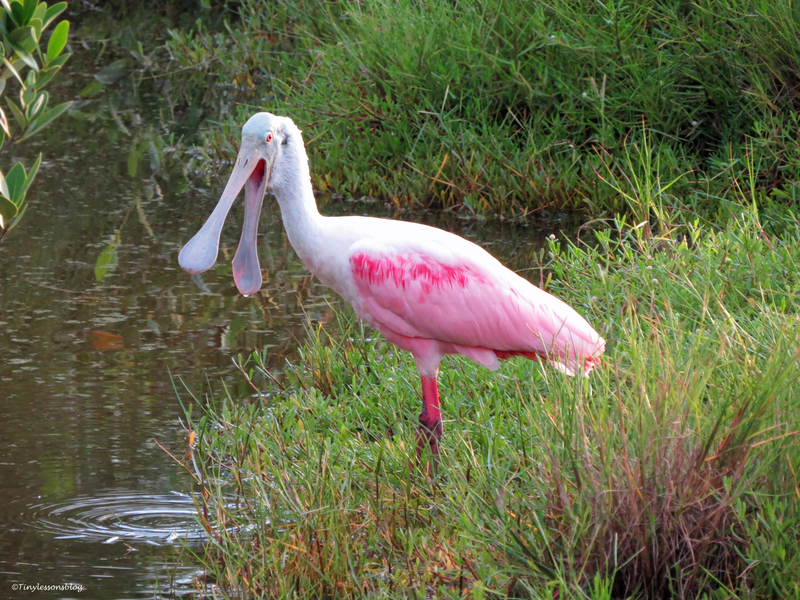 …to this juvenile, who might have been his offspring. I took a short video clip of the early morning activities. And later added my last footage on Sindile from Sunday. 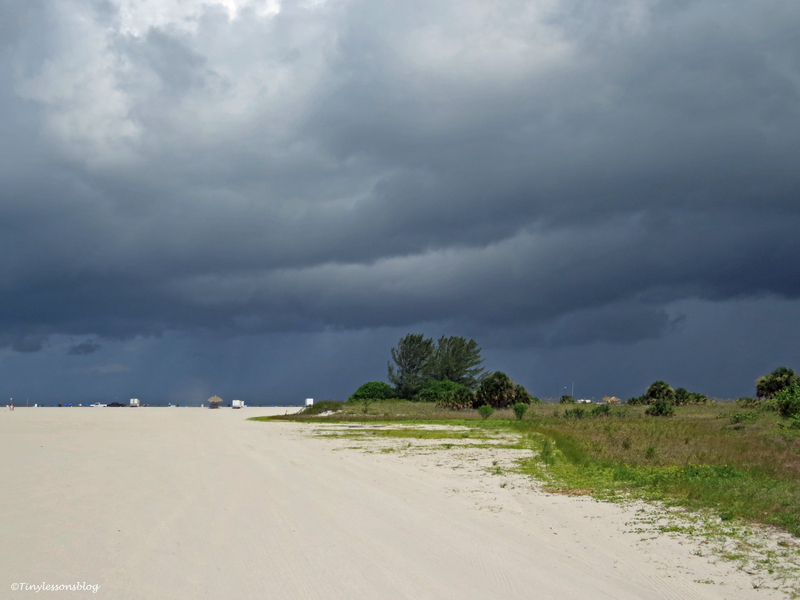 I had to leave the salt marsh quite abruptly as a morning storm was approaching from the ocean. 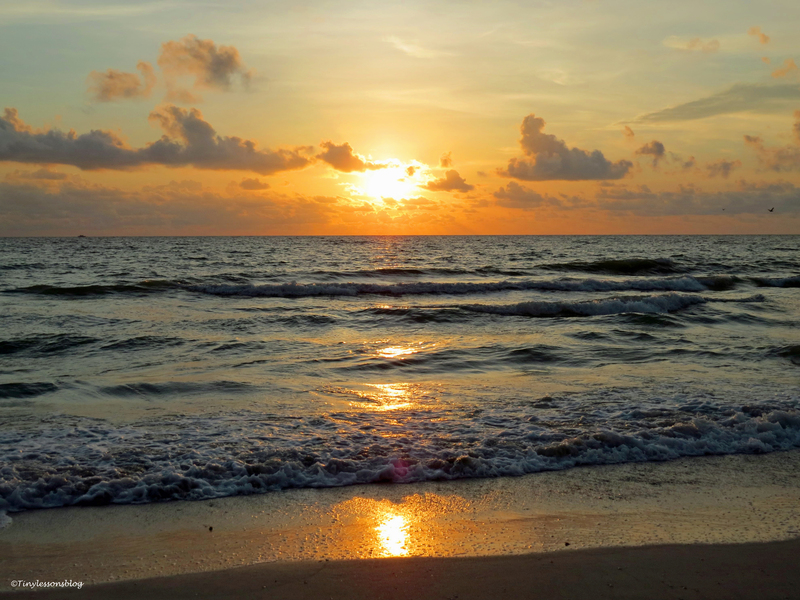 A morning storm is brewing over the Gulf. Passing the nest again, I snapped one more picture of Sindile. She looked so “adult” and in control. Little did I know it would be my last picture of her. At least for now. I checked on her from my window before going to my lunch meeting. She was still in the nest. 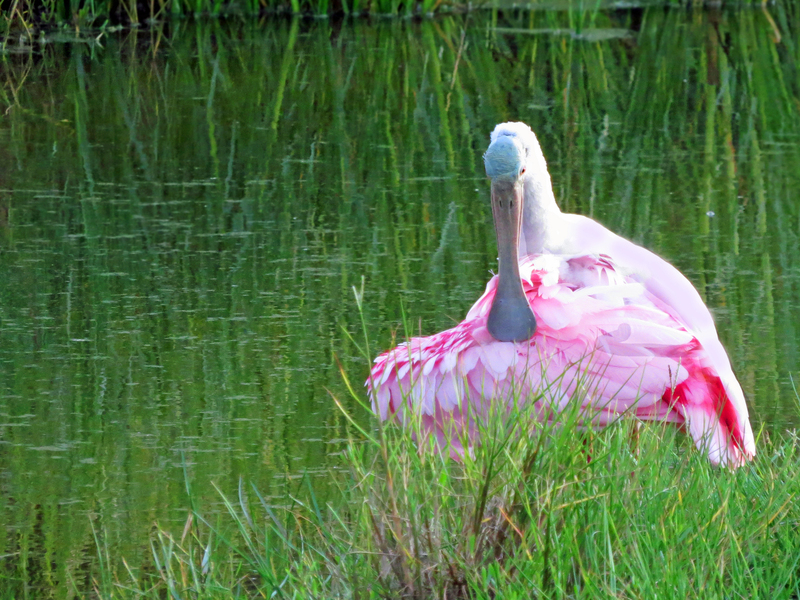 But when I came back around 3 p.m., the nest was empty. The empty nest at sunset yesterday. 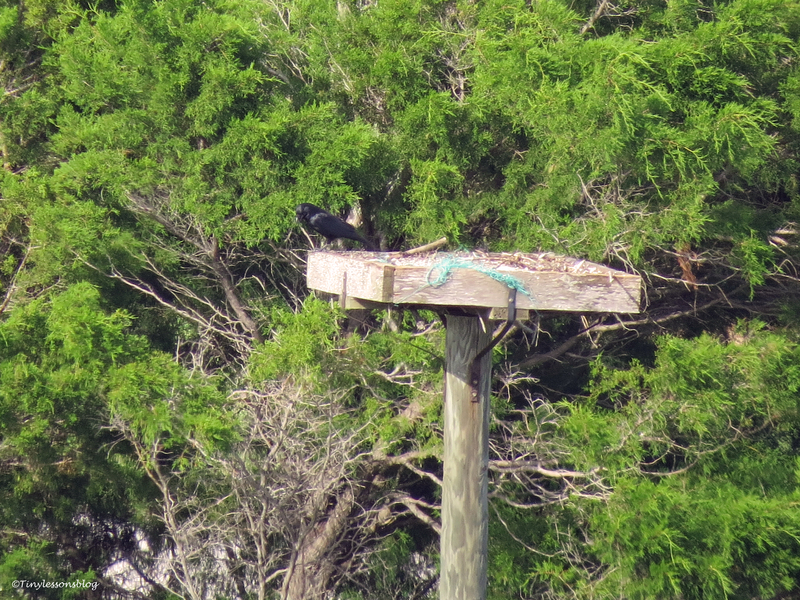 I kept an eye on the nest in the evening until it was dark. She didn’t come back. 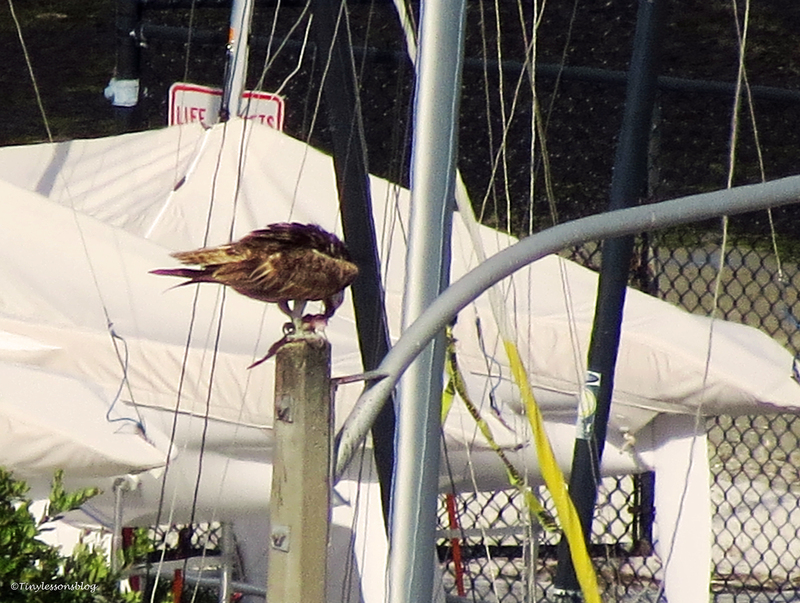 Papa Stanley was perched on his usual lamp-post at the Sailing Center. 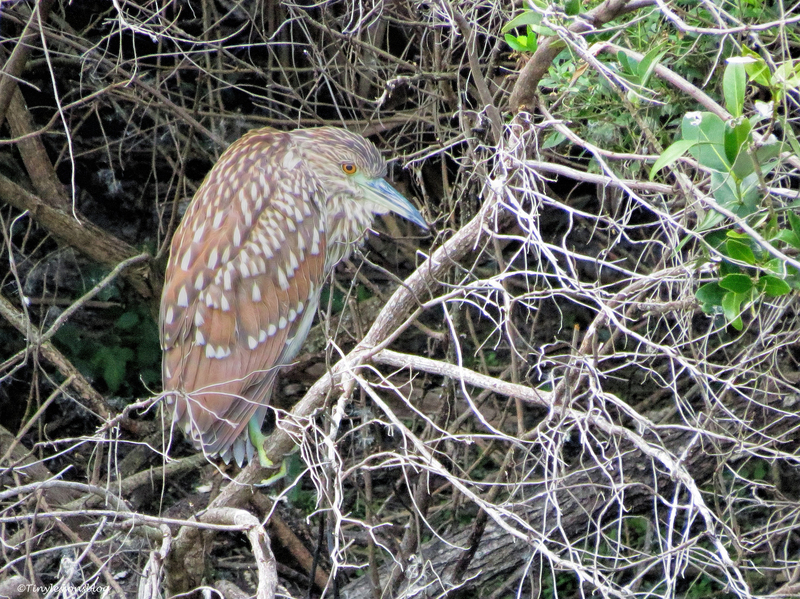 It’s quite a bit further than the nest, but I could see he caught a fish two times last night. Just in case Sindile would come back. He is a good dad. And his tough love had worked. He was eligible for a good vacation. Papa Stanley starts on his second fish for the night – as seen from my terrace. 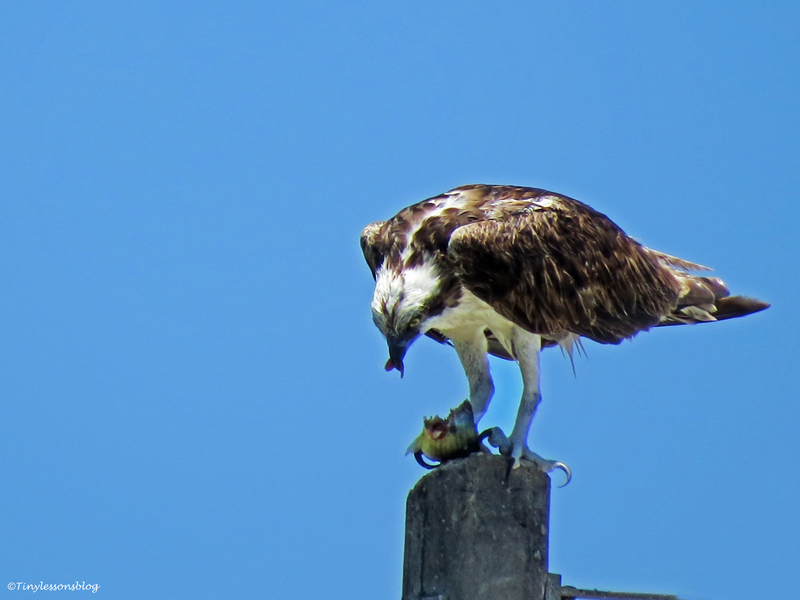 I’m sure he only ate the head in order to bring it to Sindile in case she returned to the nest. 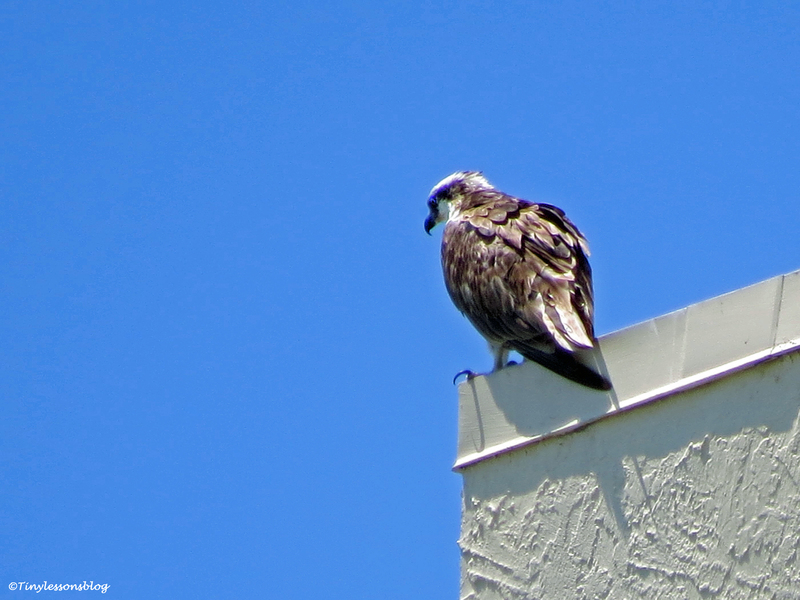 This morning he was perched there again, turned toward the nest. I’m not sure whether or not he spent the night there. But Sindile had left the nest for good. 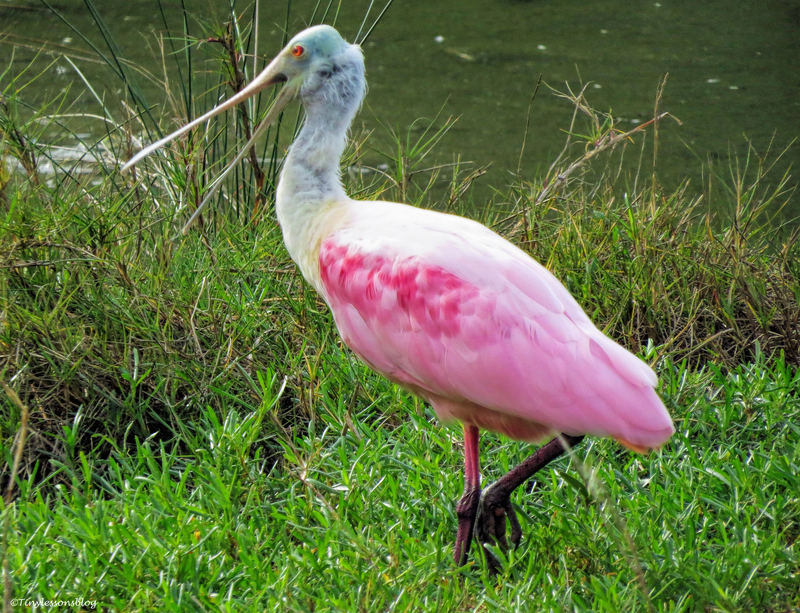 She had enough confidence in her fishing skills to embark on independent life. Goodbye and good luck, Sindile! I will miss you. My last picture of Sindile in the nest yesterday morning. 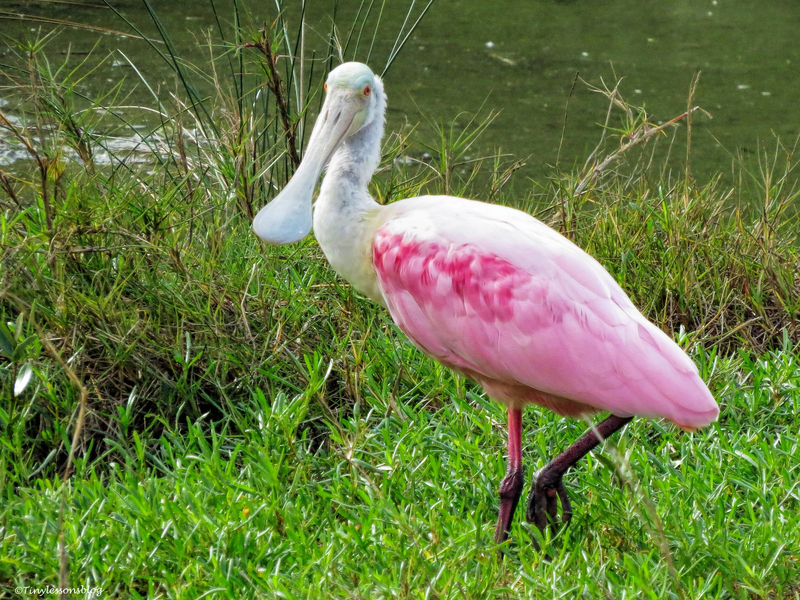 Next week, I’ll peek into Mama Sandy’s calendar to prepare a short recap of Sandy’s and Stanley’s successful nesting season. I have to lift my hat to them, such talented parents! That’s all from the salt marsh this week. Have a great week!